Self-evaluation is something you do on your own but it only works if you do it and for most that means if it isn’t on a schedule it’s only some sort of vague sensing of where you are at regarding the focus area. This one can be such an easy fix. First decide what the win is. Write yourself some questions. And then put in your calendar when you are going to ask them of yourself. Are you still doing devos 5 days a week? On a scale of 1-10 how do you feel about maintaining the boundaries you set? Did the clutter reappear or are you celebrating simplicity? Are you as far as you planned in your project? Again, it only helps if you do it! What questions do you want to ask yourself? How will you remember to do it? When do you need to ask next? 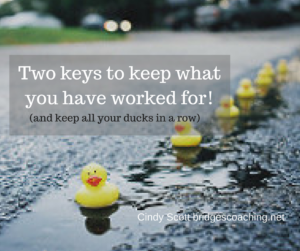 Then – make adjustments as needed and remember to set another reminder to do it all again! The people around you are a valuable asset IF you invite them into your life. There are three kinds of feedback. One, is the unspoken kind; it could be insightful but it isn’t given for some reason. The second is given freely but uninvited; there is probably some important awareness that could be gleaned from the perspective but since it usually comes in such a unwelcomed way only the savvy can hear or see the value. The third kind is the best. Insightful feedback comes when we invite someone into our growth circle, especially when we make them aware of a specific focus area and ask them to share with us if they see anything they think we would like to know. Recently a friend asked how I was doing. I gave them the run down about work, but then they asked how I was really doing. They truly wanted to share in my life, even challenging me that if I kept the hard stuff in my life to myself that I would be robbing them of the experience of supporting me. Woah! I was so motivated. I shared my heart happily and asked that they ask me regularly about my personal life. It’s hard for me to explore my emotions, but when friends offer I want to accept, learn and grow. Who might you be robbing of connection? Who do you need to invite into your life?